» Episode Guide » Viewing Episode: ポケモン！きみにきめた！/Pokémon! I Choose You! The Japanese announcer specifically states that Nidorino goes to sleep. The English dub skips that point. Japanese Announcer: It fell asleep! 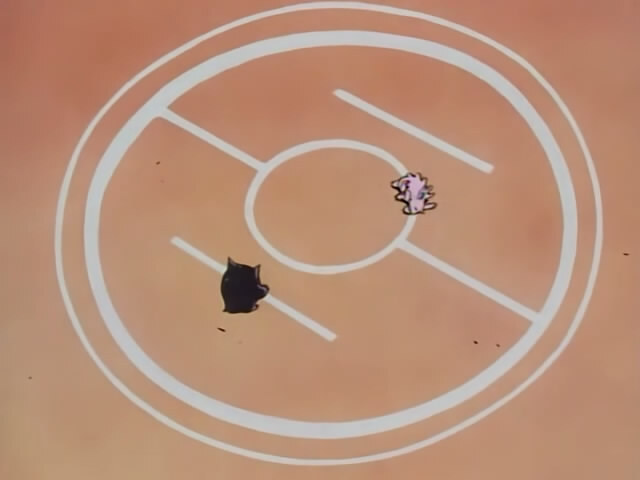 The Japanese announcer specifically states that Iwark uses Tackle (たいあたり). The English dub announcer does not. English Dub Announcer: Now this giant Pokémon's on the attack! Japanese Announcer: A Tackle attack! How do you like that? 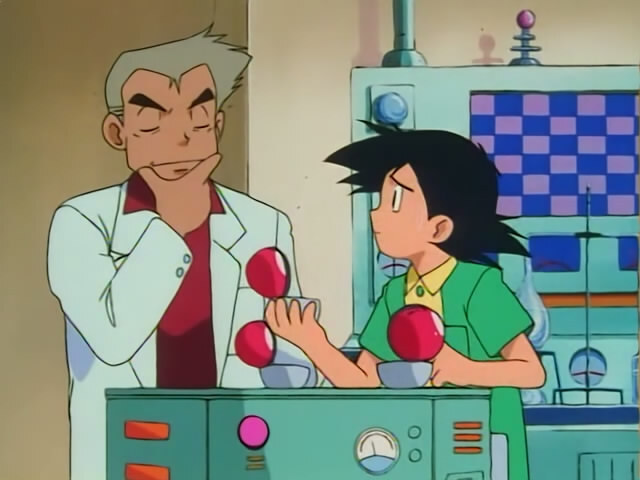 The English dub changes the first narrator line to remove the reduntant fact stating Ash is 10 years old but then later adds it to the Professor Oak line. 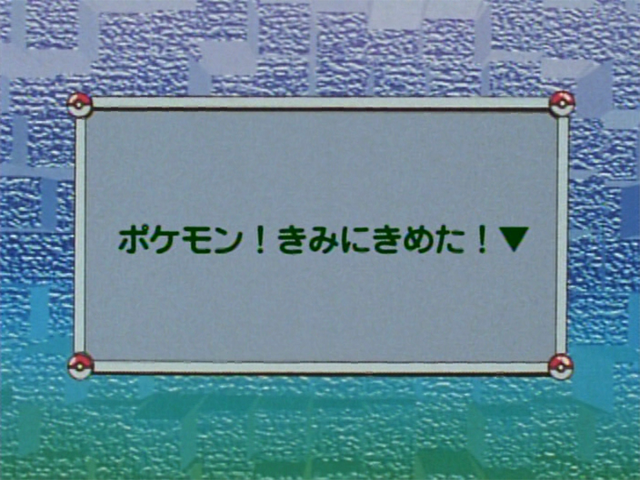 The Japanese narrator also responds to Satoshi's original introduction by saying "That's right. 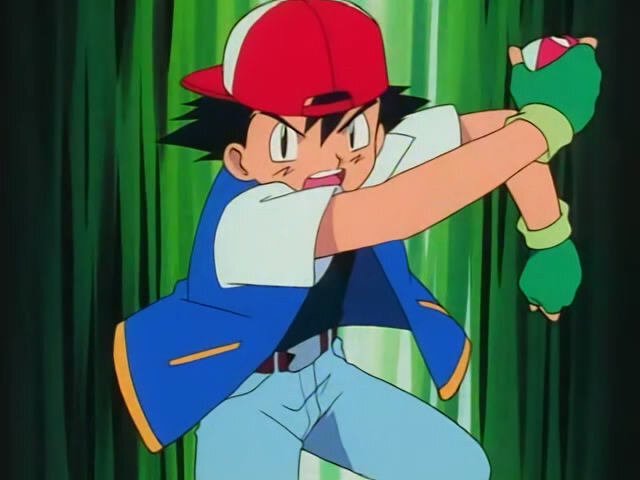 ", confirming Satoshi identity, age and hometown whereas the English dub narrator just doesn't comment and just says he's Ash Ketchum from Pallett Town. 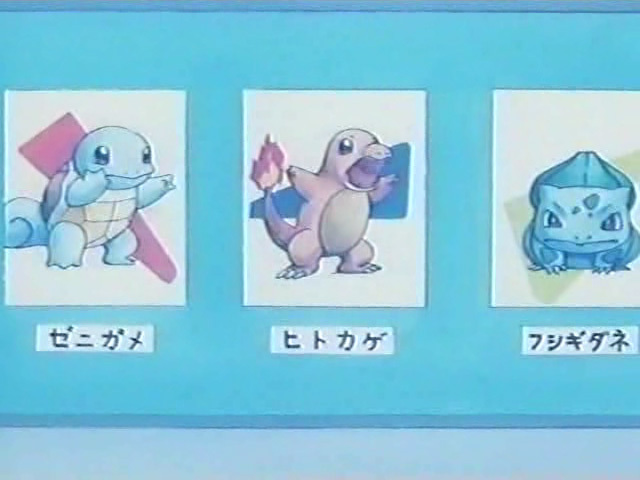 Satoshi in the Japanese original states that he'll be the best trainer then corrects himself by saying he'll be a Pokémon Master. 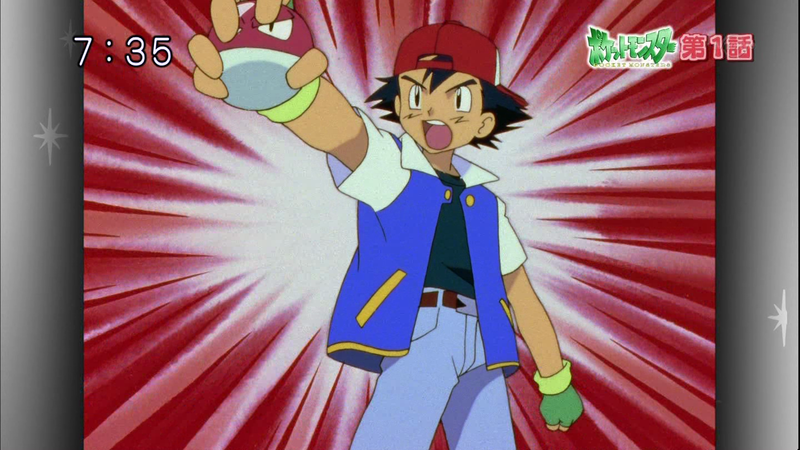 In the English dub, Ash doesn't make the 'mistake' of stating he'll just be a trainer and says he'll be a Pokémon Master. 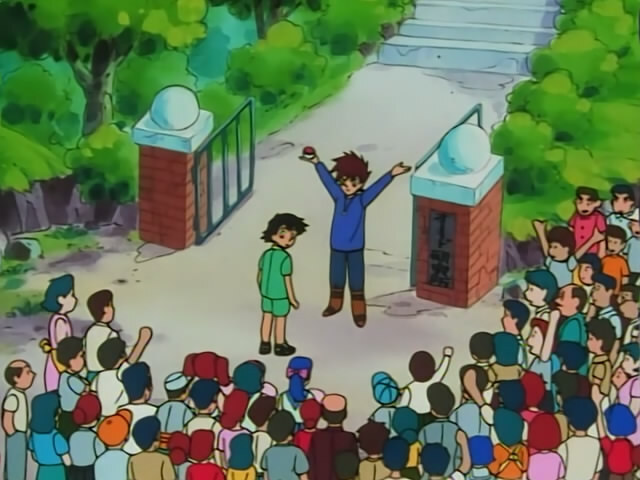 Ash: And I hereby declare to the Pokémon of the world, I will be a Pokémon Master. Pokémon Master! 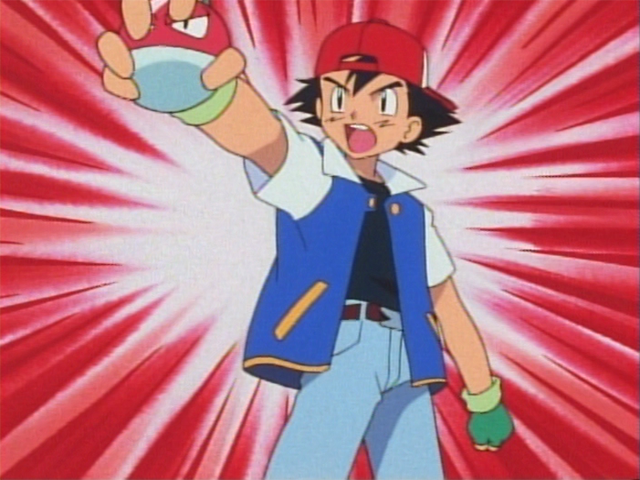 Satoshi: The best Pokémon Trainer... No, a Pokémon Master, that will be me! 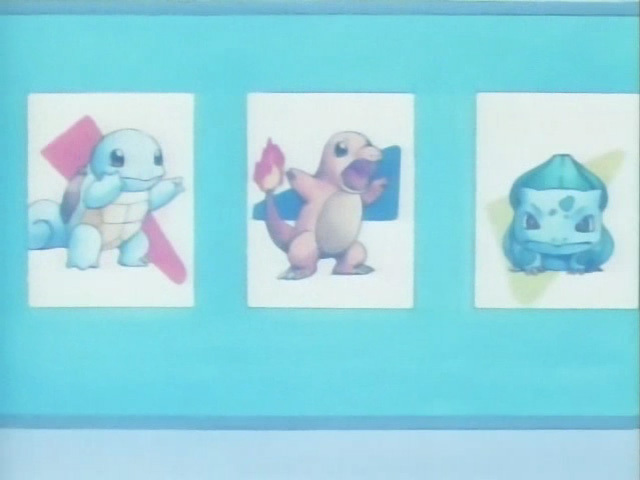 In the Digitally Remastered version, the red and white background is actually animated and flickers around Satoshi. 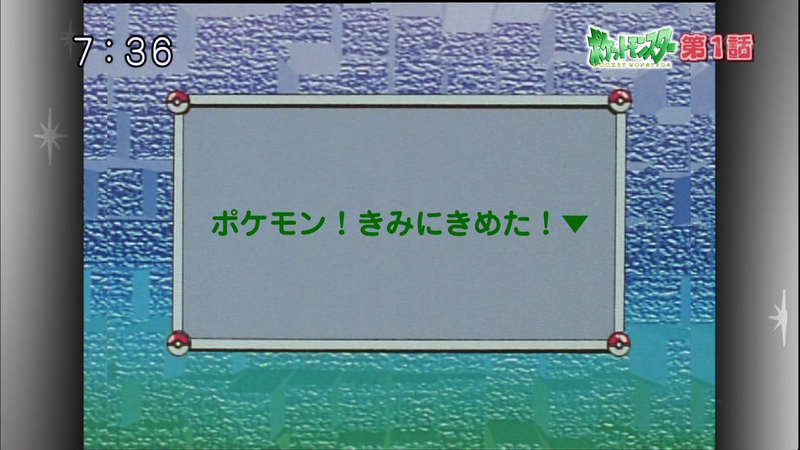 The Japanese DVD has a static background. 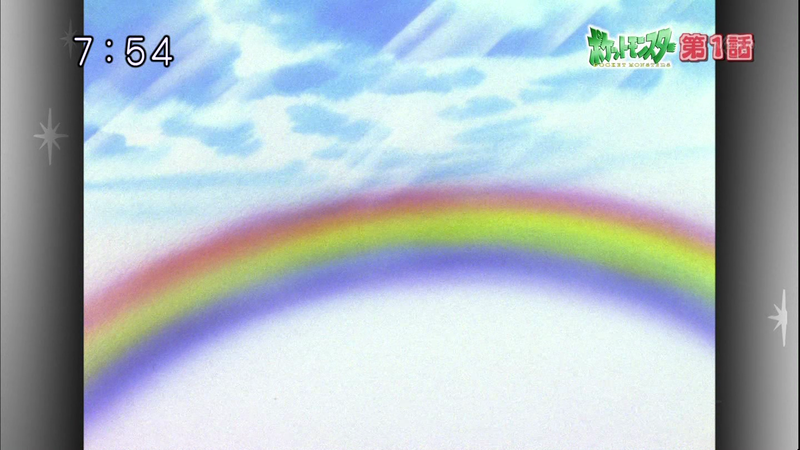 In the remastered version, the title was completely reanimated and the color made a lighter green. 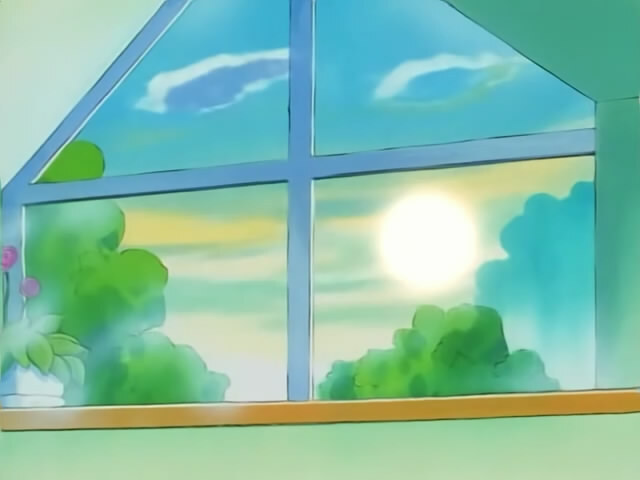 Satoshi realizes that he slept in because it was bright out. Ash doesn't state anything about being bright or seeing the sun. 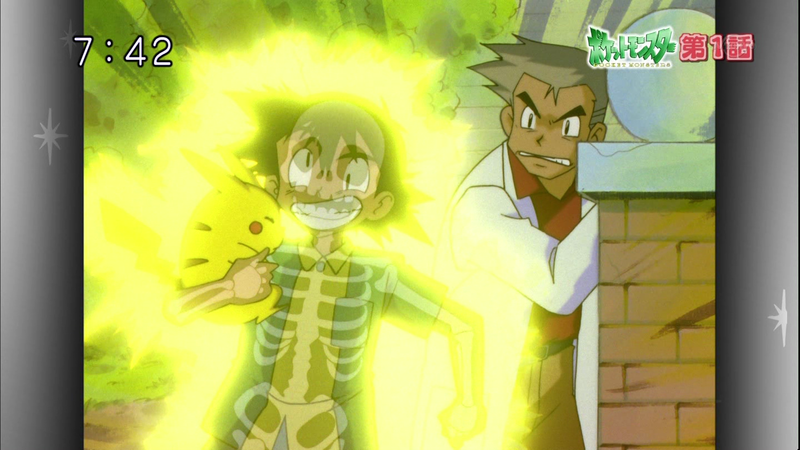 Ash: Oh, no! What time is it?! 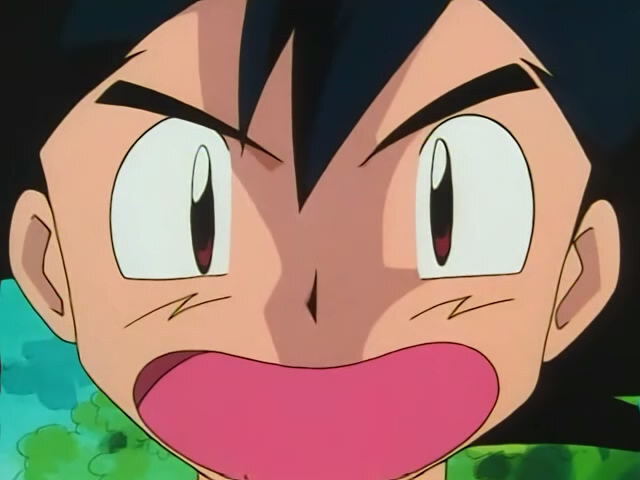 Gary says nothing about being Ash's rival like Shigeru does in the Japanese original. Gary: And you're way behind right from the start. Shigeru: As my rival you're already falling behind! Gary calls the girls 'fans' while Shigeru calls them 'girlfriends'. Gary: Thank you, fans, Thank you all for this great honor. Shigeru: Thank you my friends, my girlfriends! 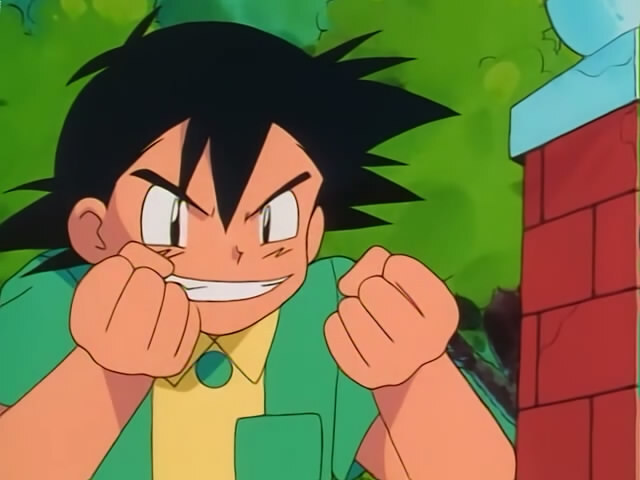 Ash says nothing specifically about Gary being his new 'rival' like Satoshi does in the Japanese original. Professor Okido believes he recognizes Satoshi and asks if that's his name specifically. 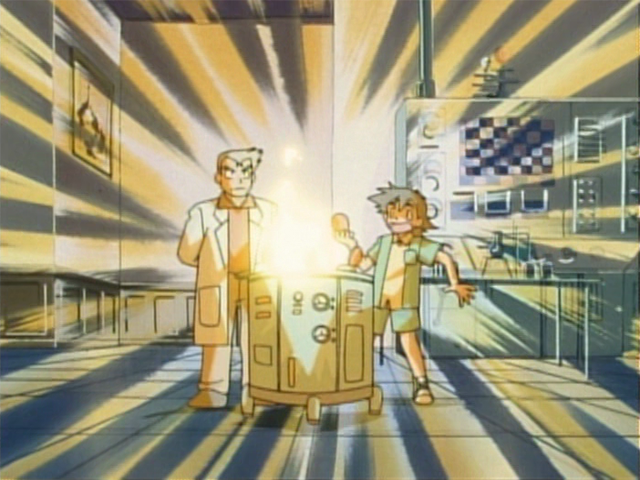 Professor Oak just assumes its Ash but doesn't say his name. Oak: So, you decided to show up after all. Okido: Ah, aren't you Satoshi-kun? 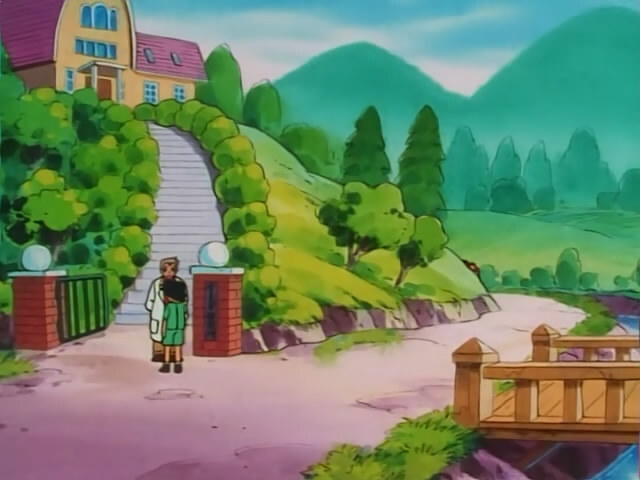 A significant difference in this line has Professor Okido stating in the Japanese original that there was 4 trainers starting their journey that day from Masara Town. The dub completely rewrites the line. Oak: You look like you're ready for bed, not for Pokémon training. Okido: Come to think of it, I heard there'd be four people today. 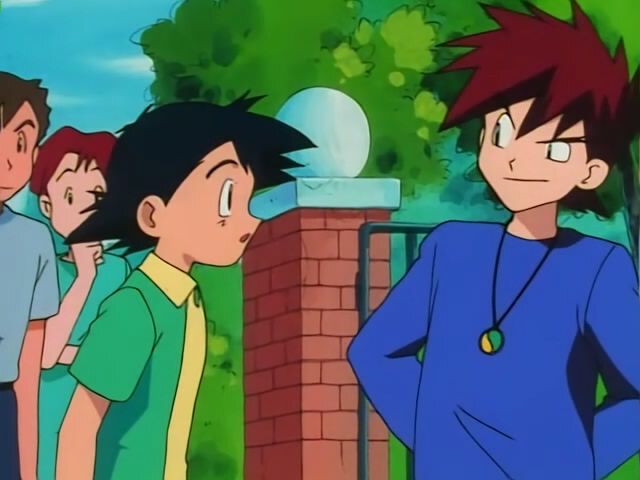 Satoshi states his age to Professor Okido to re-enforce that he was 10 years old, old enough to train Pokémon. 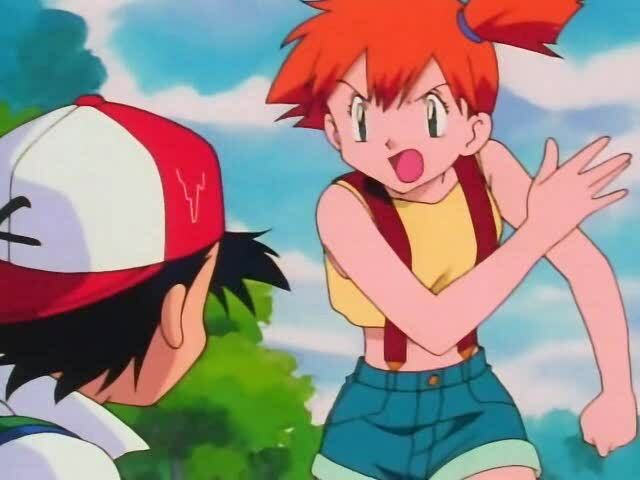 Ash: But, believe me, I'm ready for a Pokémon. Satoshi: I'm a ten-year-old boy. At any rate, I should also get a Pokémon. 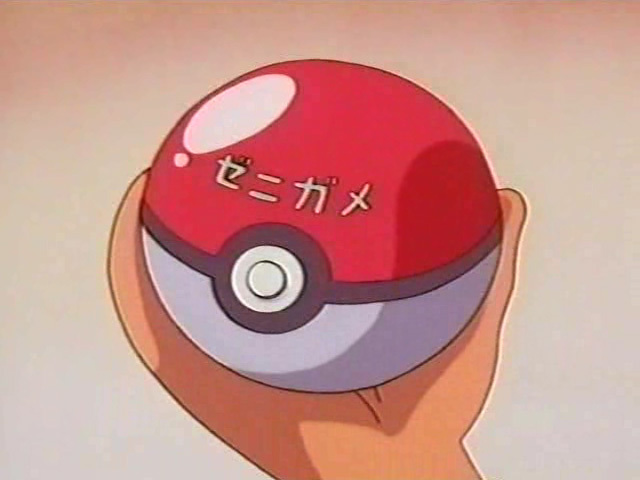 The English dub removed ゼニガメ (Squirtle/Zenigame) from the Pokeball. The English dub removed ヒトカゲ (Charmander/Hitokage) from the Pokeball. The English dub removed フシギダネ (Bulbasaur/Fushigidane) from the Pokeball. 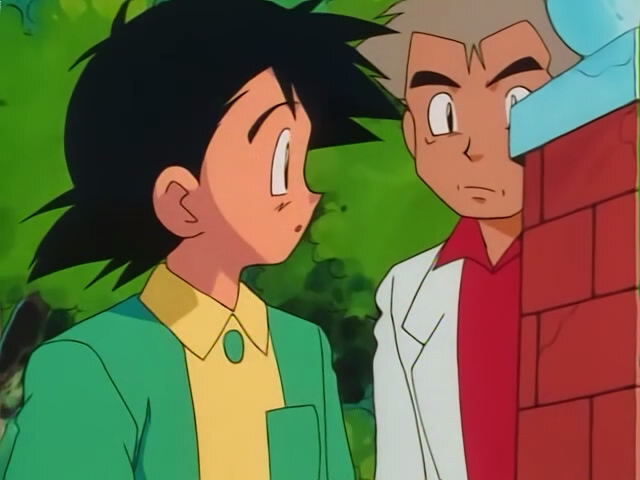 Professor Oak in the English dub used a popular English proverb 'The early bird gets the worm' to tell Ash that he was late. The Japanese original has a similar but Okido's reference is missing the train to work instead. Commuting to work by train is quite common in Japan. 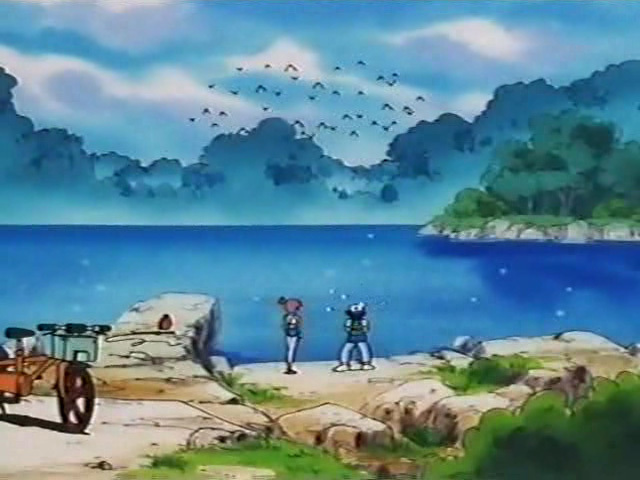 Oak: The early bird gets the worm or in this case, the Pokémon. Okido: Be it the train to work or Pokémon, one second off will change your life. 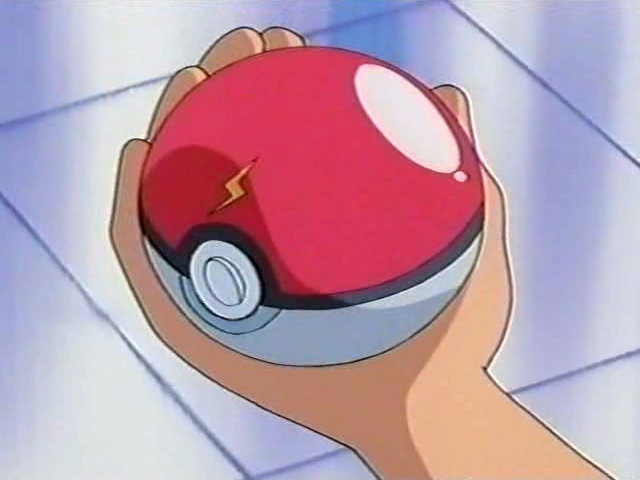 Pikachu's Poké Ball has a lightning bolt on it, but later the bolt is gone. 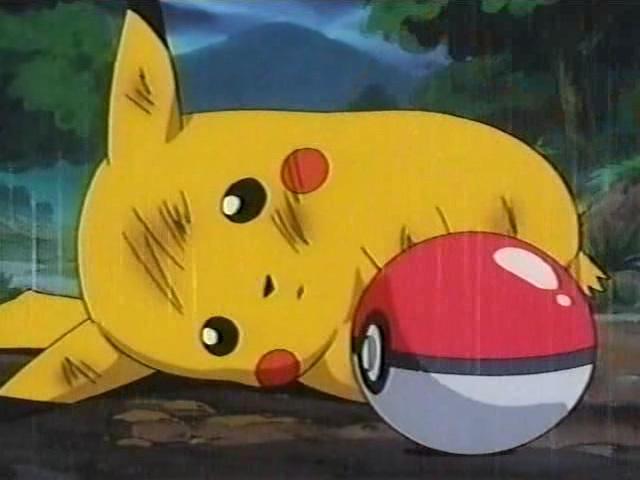 In the Remastered version, when Pikachu comes out of its monster ball, the animation was redone to make it flicker faster than the DVD version. 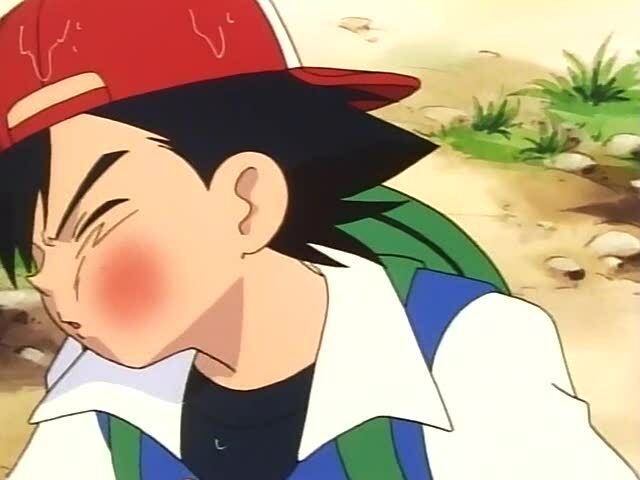 In the Remastered version, when Pikachu shocks Satoshi, the animation was redone to make the frame changes cleaner than the DVD version. 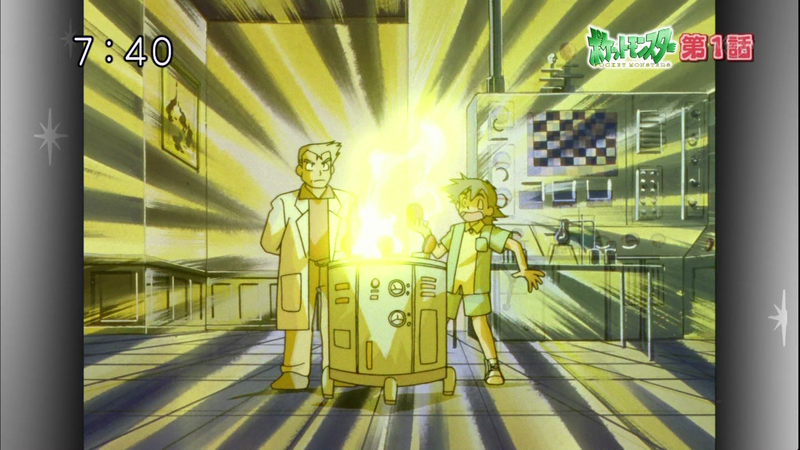 Professor Okido in the Japanese original was finishing his statement about what he was giving to Satoshi when Pikachu shocks them. 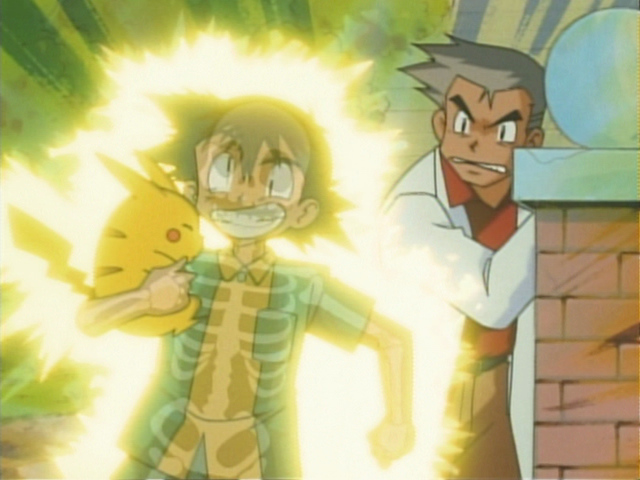 Professor Oak had already finished telling Ash. 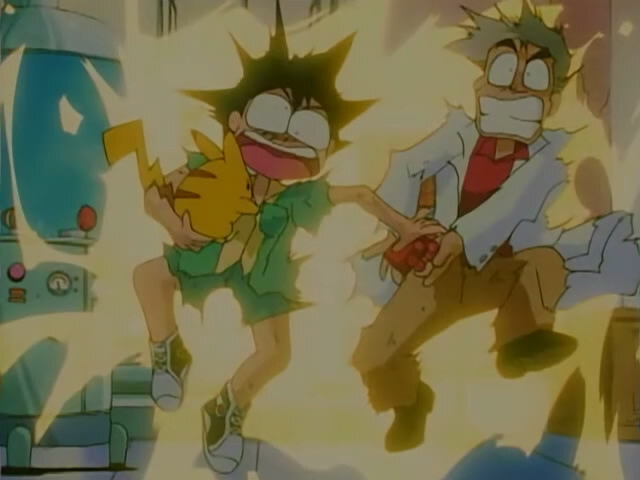 In the Remastered version, when Pikachu shocks Satoshi and Okido, the animation was redone to make the frame changes cleaner than the DVD version. 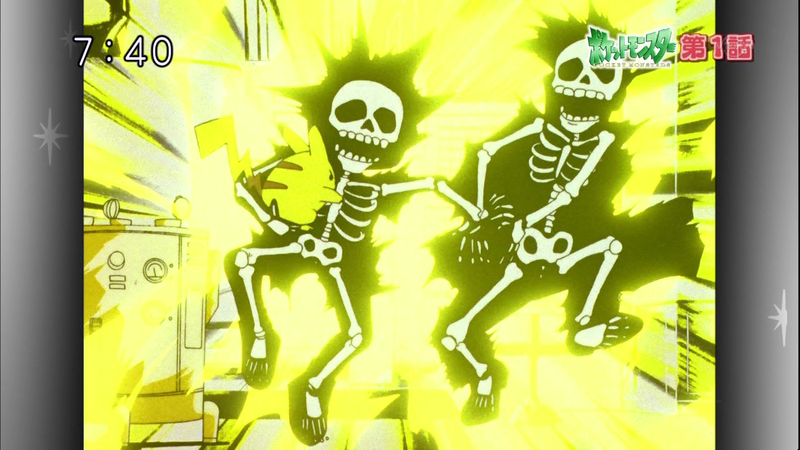 In the DVD version, their skeletons are only seen twice in the sequence and barely visible whereas the remastered version their skeletons are quite clear and are visible far more often. 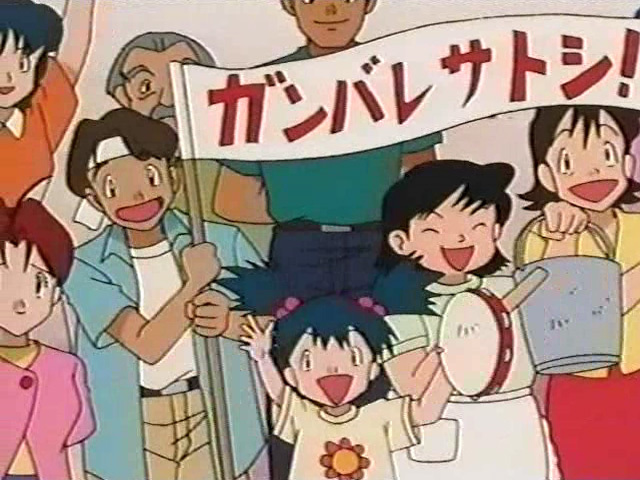 The banner in the Japanese episode says: Good Luck Satoshi! 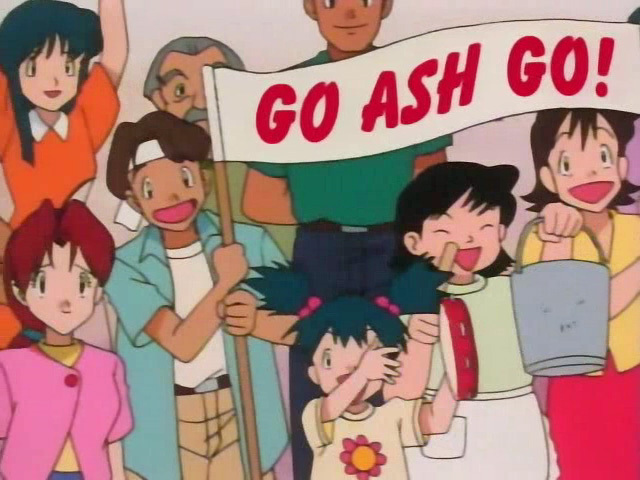 （ガンバレサトシ！ Ganbare Satoshi!） and in the English dub it was replaced with "GO ASH GO!" 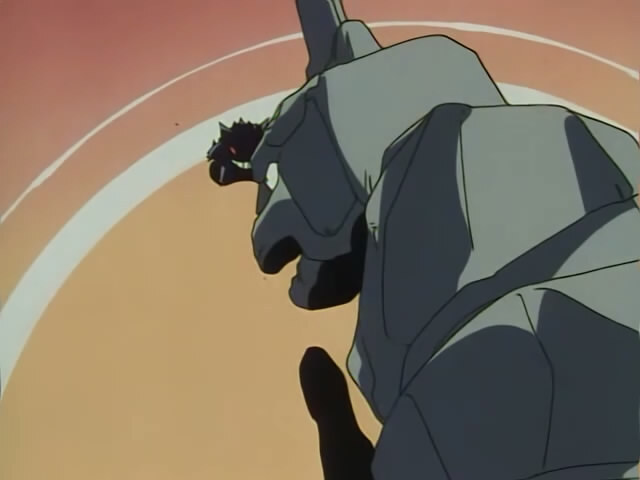 The crowd says nothing in the English dub. Hanako is a bit more harsh with Satoshi compared to Delia in the English dub. 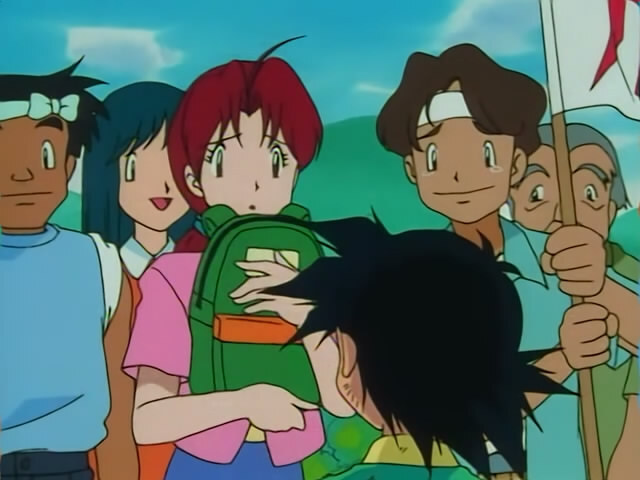 Hanako also tells Satoshi she's prepared his bag for him, something Delia doesn't say. 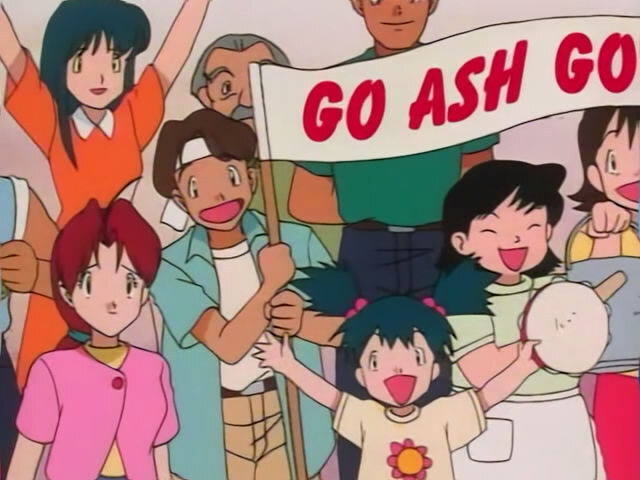 Delia: Oh, Ash, I'm so proud of you. 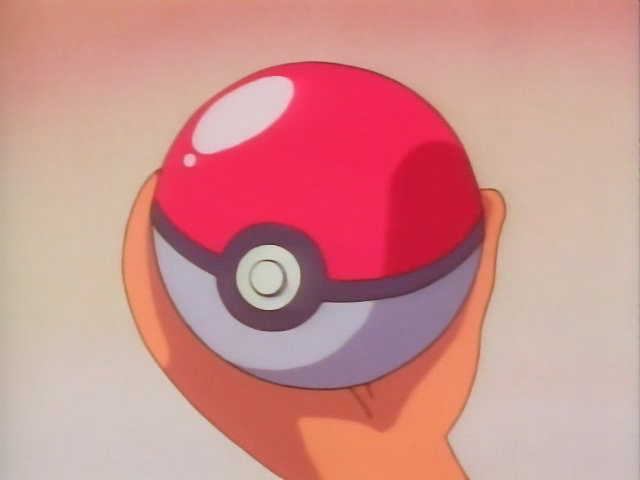 You're finally going to fulfill your dream and start your Pokémon training. Hanako: It's your own fault that you were late. Anyhow, we have to say goodbye for a while. I've prepared your traveling gear. 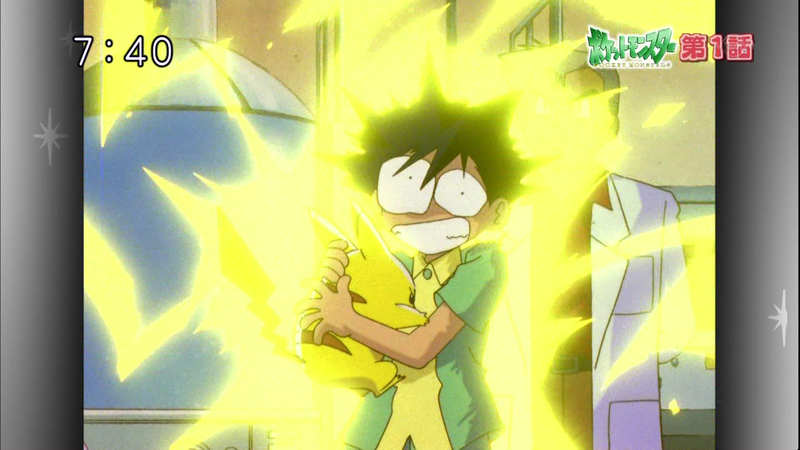 Delia packs Hot Chocolate for Ash in the English dub while Hanako packs emergency rations for Satoshi. Delia: I packed your sneakers and jeans, nice clean shirts and underwear, and your favorite snacks. And some hot chocolate in case you want something hot, but be careful not to burn yourself. Hanako: Here you go. Shoes, jeans, shirts, and underpants. For food, I stuffed some instant meals in here in case of an emergency. The dub changed the translation to underwear instead of pajamas. This underwear statement would become Delia's most common line in the English dub. Delia: Don't forget to change your underwear. Hanako: Change into your pajamas when you go to sleep. Even if it's 'those' pajamas. 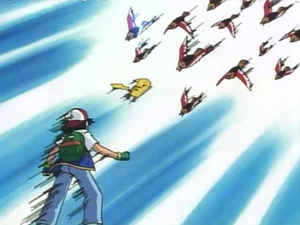 In the Remastered version, when Pikachu shocks Satoshi and the crowd outside, the animation was redone to make the frame changes cleaner than the DVD version. 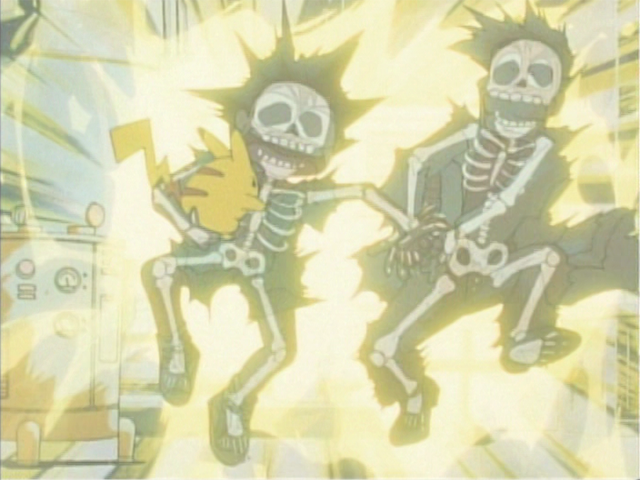 In the DVD version, Satoshi's skeleton hardly visible in the sequence and barely visible whereas in the remastered version Satoshi's skeleton can be seen and is visible far more often. This scene makes a bit more sense in the Japanese original when viewers understand the pun on the word "hanashi" (話) which can mean both "a talk" and "toothless". 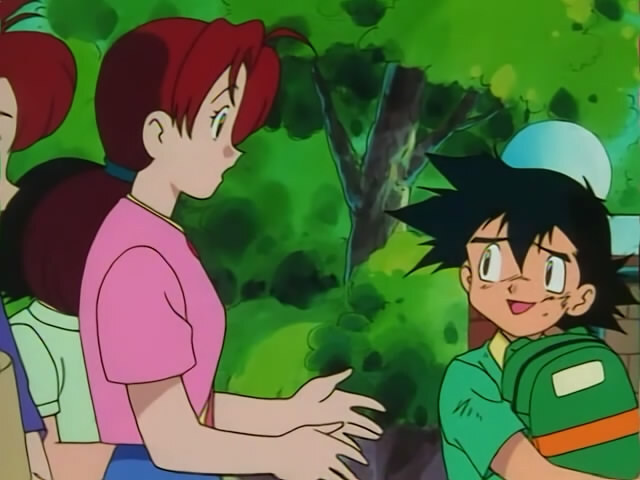 Ash: Well, I like you a lot. And since you're the Pokémon I'm training, don't you think you could be a little nicer and just open your mouth and tell me what's wrong? Satoshi: If you could talk to me just a little, that'd be nice. You do have teeth, so you're not toothless. You don't want to talk? 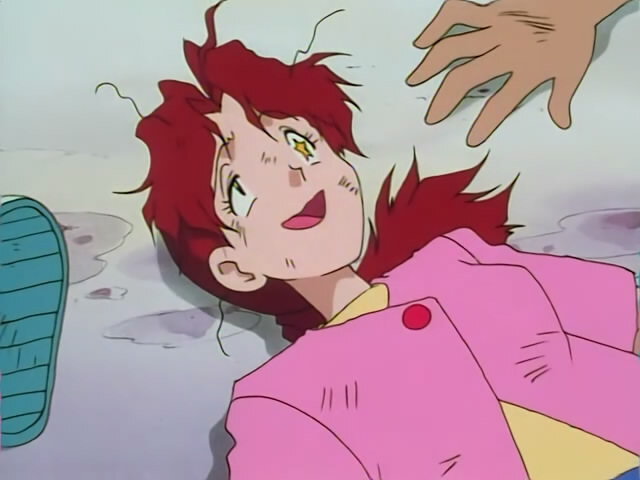 In the Japanese episode, Misty slaps Ash when she finds out about his injured Pikachu. 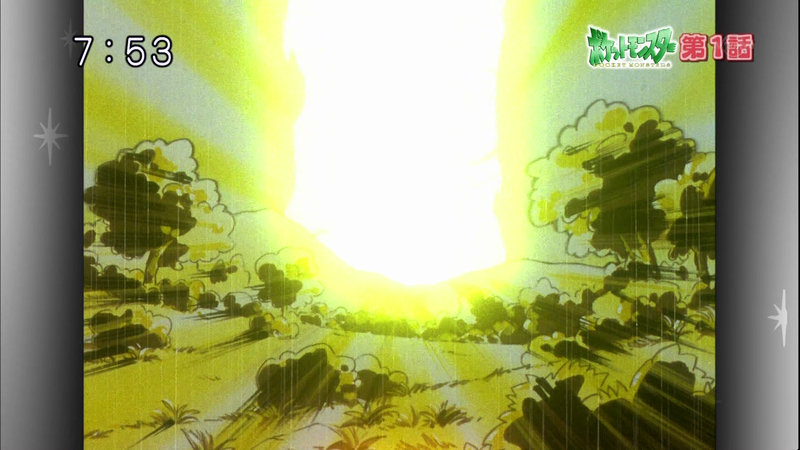 This was removed in the dub. 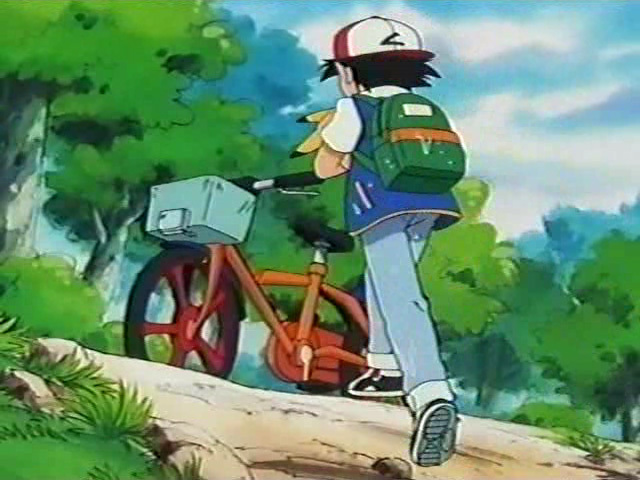 When Satoshi runs up towards Kasumi's bike, his shoes are completely painted white, making it look like he was only wearing socks. When he arrives at her bike, his shoes are painted correctly. 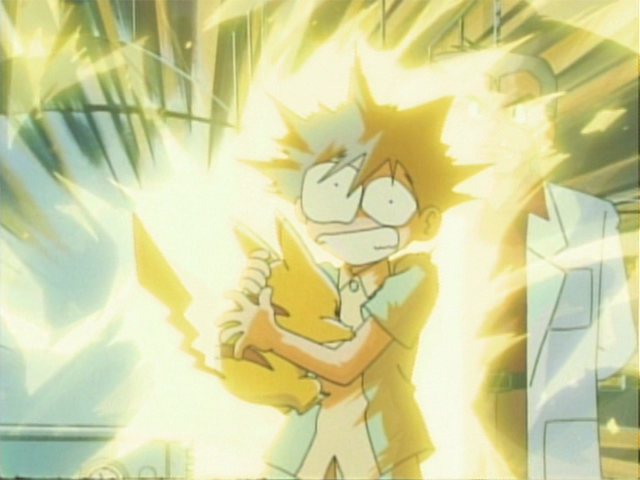 In the Remastered version, when Pikachu jumps up and uses his Thunderbolt attack, the animation is a lot cleaner and movement in the bolt can be seen which is not very evident in the DVD version. 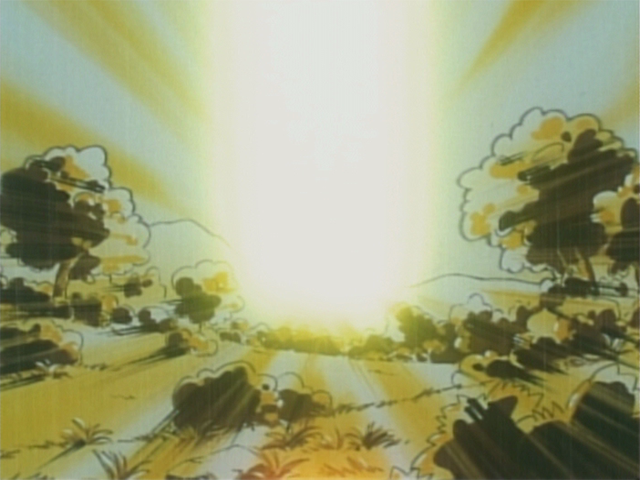 In the Remastered version, Ho-oh's sparkles completely dissipate before the scene change fade but in the DVD version they continue through the fade transition for a few seconds. 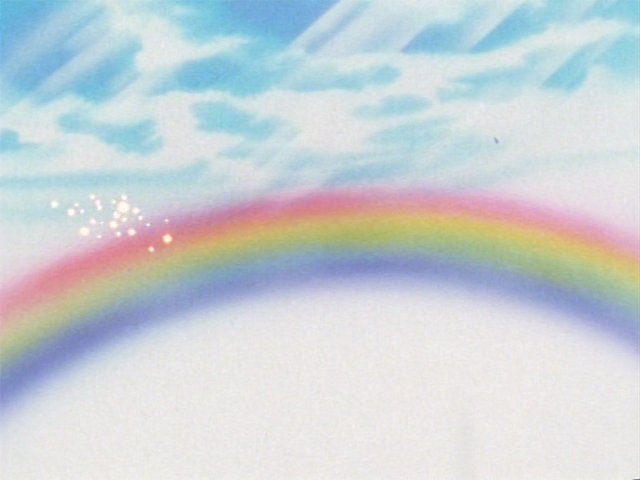 The sparkles are also golden in the remastered version while they are white in the DVD version. Pokémon - Vol. 01: I Choose You! Pikachu! Pokémon Vol. 01 - Entscheidung für Pikachu! Pokémon Vol. 01 - Ik Kies Jou! Pikachu! 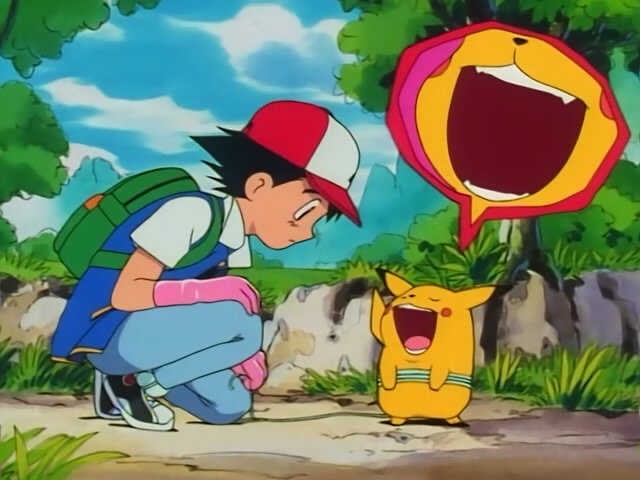 Pokémon nº1: ¡Pikachu, te elijo a ti! Pokémon Partner up with Pikachu! 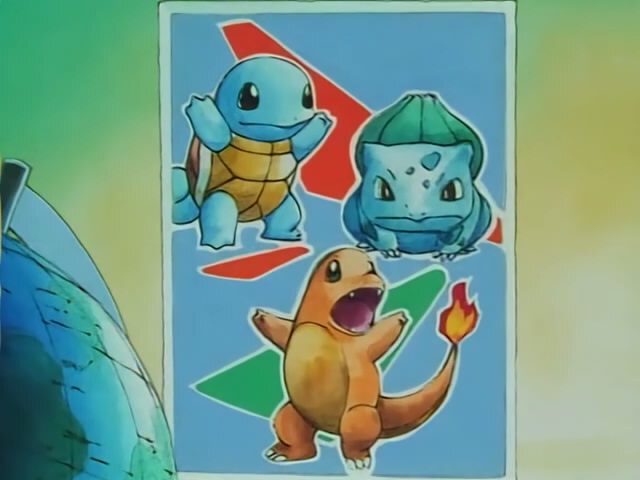 Pokémon Eu Escolho Você, Pikachu!